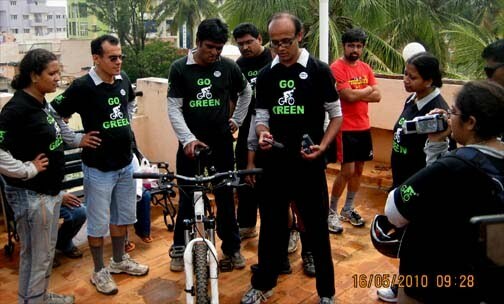 Go Green Campaign Ride towards GoGreen Rao's Residence on 16 May 2010. - GGI-Group size: 4000+ Professionals, Increasing on day to day basis, Come & join us 2 serve Mother Nature. Go Green Campaign Ride towards GoGreen Rao's Residence on 16 May 2010. A big Hurrrray for our GGI-Group !! 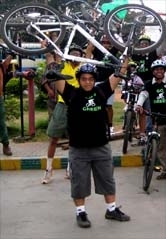 Totally 43 GGI's Participated for this weeks 16May2010 Campaign Ride. Wish to have more and more people into our campaign Rides and make a difference.. We had 2 guests in our ride. Mallik from Hydrabad who leads our Hydrabad GGI-group and Amit his college who was from Pune both came to my residence @ 5:30am. 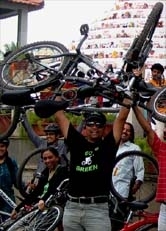 I had arranged 2 bicycles for them for the ride however Amit was cycling after very long years hence was not confidence about peddling for the entire stretch of ride. We started by 6:15am from my residence and reached RIS junction by 6:35am. While people were joining from all directions.. Our professional photographer Vinay had come to take photographs & we also had a local Kannada Kasturi channel who showed up to cover our Campaign Ride. We wish to thank Madhu & his Crew for showing up on time. After the interview we started from RIS junction by 6:55am. Meanwhile other media people were calling and asking us to wait but since we were late hence opted to start. When we reached Cubbon park, We had couple of more GGI's who had come from other directions who were waiting for us. Reached by 7:30am. to our surprise their was a huge running crowed in Cubbon park, practicing for Sunfeast Run. We all took the advantage of their presence to show case our group's Initiative. Went all along cubbon park then started of to JP Nagar. day/ Apple Mac show room - RV Dental Colleage - Nandani Hotel - IDBI Bank - Spencer Departmental stores - (1st left & 1st Right ) Pranal Enclave. 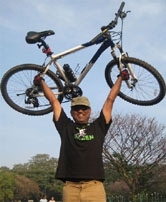 This is Janarthan a retired railway officer, 77 years young passionate to Cycle and we were very glad to have him in our Group & he was actively participated in the ride .. Hats off to these people who r striving hard to put forth their time and efforts to initiate Going Green..
Names of Newbies, reading from left to right. One of our GGI Reshmin an environmental evangelist demonstrated following products. 2) An 3 in one Lock / Head light & a Tail lamp blinker. 3) A Bottle holder with a locking string attached. 4) Nano coating solution. All are great products wish to c them soon.